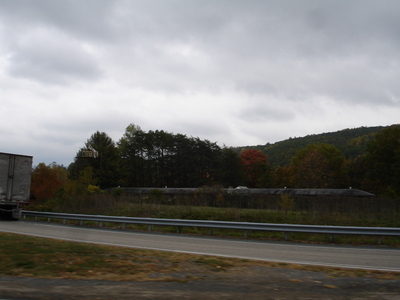 I just got back from a road trip from Philadelphia down through the South, and spotted a lot of abandonment along the way. The real pay dirt was in Jackson, Mississippi, a capital city with a downtown as eerily abandoned as Baton Rouge's. Anyone ever see the early '70s movie The Omega Man, starring Charlton Heston? I recommend it during this fine Halloween season, and driving through empty Jackson was like Heston driving through empty L.A. in that movie. ...of the non-abandoned kind. Sorry I've been away, but sometimes the paying jobs take precedent over the abandoned documentation job. Also I haven't had use of a car or the good camera. However, in about three weeks I will have my beloved wheels back in my possession, and because of that, I will have much more access to the good camera. Since my last post I made two trips to New Orleans, and the first one took me to an area I had never seen, one which had so many abandoned businesses and homes that I nearly drove off the road a few times gawking at them. Driving past the still-prominent damage from Katrina (including another abandoned Winn Dixie with weeds coming up throughout the parking lot) while listening to the people on the radio discuss the nooses that were recently hung across the state in Jena was enough to give me the hair-standing-on-end shiver I used to get whenever I got near the Ground Zero site in lower Manhattan. Time to change the channel or I'll cry. I don't feel qualified to even go there in New Orleans, not to mention that (to make another Big Apple comparison), the crime rate there is comparable to New York in the '70s, I'm told. No wandering around down there for me, although that is a fascinating project just waiting to happen, photographers! But here's an article about how homeless people have taken over some of the abandoned buildings in New Orleans. 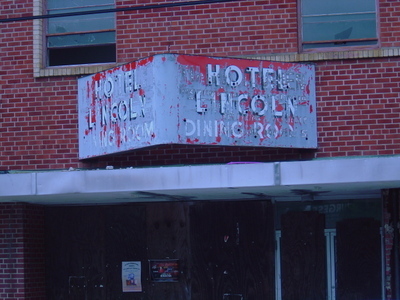 Also, remember the Lincoln Hotel? I couldn't find anything about it when I first shot photos of it a few weeks ago, but I just read this article in The Advocate mentioning that Aretha Franklin stayed there! So, probably, did James Brown, B.B. King, and Nat King Cole. The article is about the barbershop next door but mentions that all of those cats had their hair did there, so I assume they were also staying at the Lincoln Hotel. Very cool. What's not so cool is my hypothesis that they stayed at this rather plain hotel becuase they were not welcome at the elegant downtown hotel that's now the Hilton Baton Rouge Capitol Center Hotel. That's pure speculation on my part, of course. I really want to go in there.